During the holidays I’m always looking for easy DIY ways to decorate the house. I also love any decoration that could be turned into a makeshift gift. After a little trip to Ikea I found these awesome larger tealight candles that are perfect for making my own candles for different seasons. 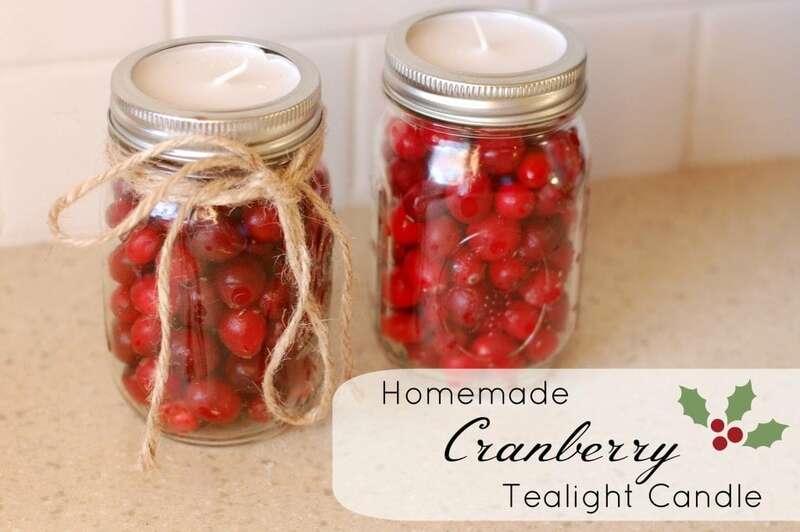 This craft for homemade cranberry candles takes a mason jar, some cranberries, and a tealight and makes it into so much more! If you have a few of these supplies lying around why not try your hand at making your own decorative candle for the holidays. Add a bit of twine and you have the perfect centerpiece or mantle display. 1. Take lid off mason jar and discard flat disc. 3. Stop at the fill line right below the neck of the jar. 4. Place the candle on top of the berries. Make sure it’s flush with the top of the jar. 5. Screw on the lid. 6. Embellish with twine, or ribbon, and enjoy your candle! What holiday crafts are you making this year? Danielle is a work-at-home-mom of two beautiful kids and writes at Simmworks Family Blog. She loves to blog about her family, healthy living, going green and crafting. Danielle would love for you to come visit! You can reach her on Facebook and Twitter as well. If you have any questions feel free to email her at simmworks@gmail.com. I am loving this! Great idea! I love cranberries! Oh how nice. I wish I had an Ikea close by, I would love to make these and you really could put just about anything in the jar, swap it out for the different holidays. Thanks for a great idea. I’m going to keep my eyes open for these larger tea light candles and if I find myself by an Ikea, I’ll be rushing in to look for these. what a beautiful idea! This is an easy to craft and great for gift giving. so pretty, i love this. I LOVE this craft! I think I’m going to fill up some mason jars with conversation hearts and do some Valentine’s candles for the table! I never thought to put the candle on top! Thanks for sharing! What size tea light candles are used? Sorry, the diameter of the candle is 2 1/4″. I gave you the measurements of the total package!